Running or trampoline bouncing: What's better exercise? Many of us are old friends (or frenemies!) 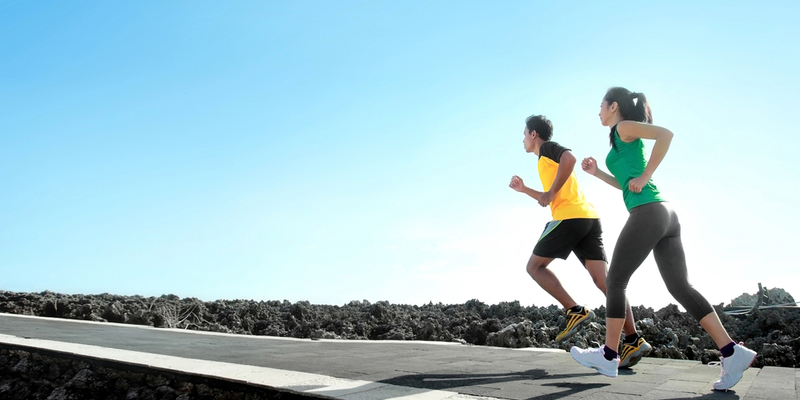 with the treadmill and the pavement; running is one of the most popular cardio activities. While all exercises that get your blood pumping are good for you, some cardio workouts are easier on your body than others—without being less 'intense'. Could Vuly Trampolines hold the key to a better workout? We’ve been brought up to perceive jogging as one of the paragons of fitness, but is it all it’s cracked up to be? We'd take a fun bounce on a trampoline over a jog down the road any day! Today, we take a closer look at these two comparable exercises, and we find an answer as to which offers a better overall workout. There’s no denying that a decent run gets your blood pumping and oxygenated, particularly if you are jogging cross country over naturally occurring dips and hills. However, running for long periods of time can cause certain muscles and joints to deteriorate. Runners are certainly more prone to injury if they opt for a concrete path that jars their joints. Although it's an easy exercise to get started on and it does burn kilojoules, running can place the body under quite a big amount of stress, and it may also affecting the endocrine system and the hormones that you release during the workout. The tortured looks on long distance runners faces are a reflection of that physical discomfort and strain that their bodies are under, and which certainly isn’t necessary for a healthy lifestyle. Two of the pros of bouncing on a trampoline are the soft and flexible mat and the safety enclosure. Not only do they prevent injury if you take a tumble, but the mat is much kinder on muscles and joints—especially if your trampoline has a strictly vertical bounce. Plus, it’s a fantastic form of aerobic exercise, getting your heart rate up even though you’re having fun! Bouncing is also great for mental health; getting outside to exercise, and enjoying yourself while you’re doing it, is far more effective than slogging away at a workout that you don't like. Remember: the best form of exercise is one that you'll actually do! Running for 30 minutes is said to burn approximately 200 calories. Plain, up-and-down bouncing on your trampoline burns around 130 calories. However, if you incorporate other exercises on your trampoline as you bounce, you could potentially burn double that number! Teamed with its cushioning effect for muscles and joints—and minimised chance of injury—trampolining workouts are not only more efficient, but better for your body too! Next time you tie on your joggers in anticipation for a run, why not head to your backyard Vuly trampoline instead? We’d love to hear if you’ve made the switch from running to trampoline workouts! What other exercises have you incorporated on your Vuly trampoline?